This weeks inspiration is quiet. I took that to mean for me quiet in the sense of peace and relaxation. It is never noise free in my life. Not where I live and work. It was timely inspiration for me. I need to spend some quality time at my peaceful relaxing place to unwind. The beach. I love it. It feels me with peace like nothing else. The soft sand under my feet, the warm sunshine on the back of my neck (sometimes lol), the refreshing rush as the water rushes over my feet, the loud crash of the waves as the surfers wipe out and the soft tinkle as the waves rush over the shells (this is my fav). It is definitely not noise free! But I find it a truly meditative place. So beautiful! I can hear and smell the ocean from the photos and your description. I haven't even seen an ocean in so many years; I really need to remedy that. Such a wonderful feeling of calm and peace looking at these photos. I always love the collage effect. Thanks for your sweet comment on my blog!! I think we both get much pleasure and inspiration from the sea... For me it is very hard to be too far away from it.. even just not being able to see it from where I live now saddens me.. hahahaha.. Need to be rich and own a home overlooking it's beauty..
love it!!! very inspirational and conducive to peace!!! Oh I so need a beach right NOW!! a beach has the perfect balance of noise and calm. love the images. what an inspirational post you have gives us today1 fabulous blog! will be back often to visit! 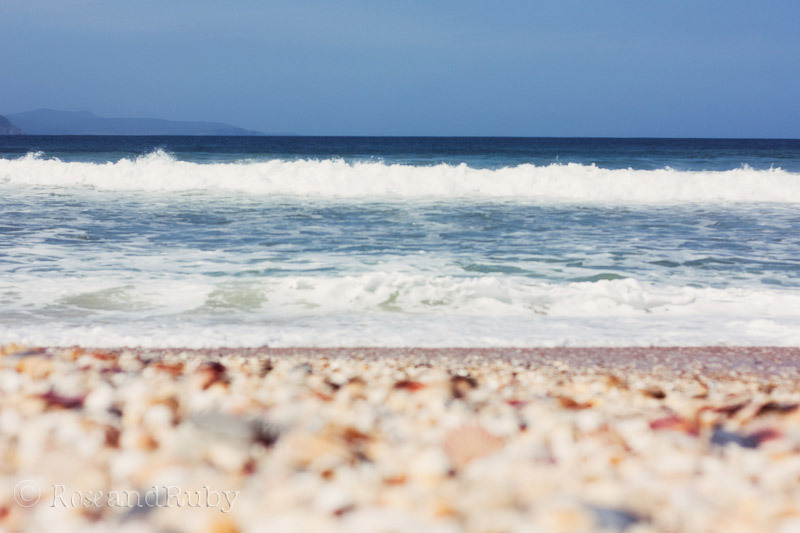 I have just found your lovely and inspiring blog tonight and heave enjoyed these beautiful images of the beach. We had a lovely trip to the beach just yesterday and my post today was ocean and sand inspired! I am going to have to keep your thoughts in my mind as we get ready for the winter ahead....lovely images, xv. Beautiful and inspiring images. The sea is a part of me. I feel at ease near the water. Have no idea why. The beach is one of my favourite places to visit ... I could sit and watch the waves for hours! It's so relaxing. Hello - I just found your blog and am really enjoying it here. Your photographs are beautiful.